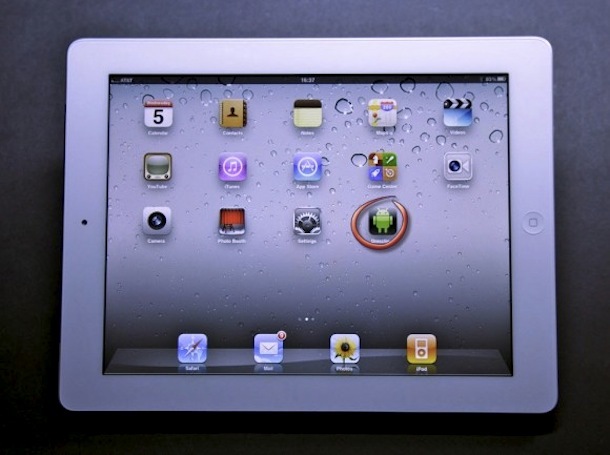 Soon you will be able to run Android apps directly on the iPad, with the help of a third party tool called Alien Dalvik. The technology works by packaging each Android application into it’s own virtual machine that runs atop iOS, giving the appearance of the app running natively on the iPad. Performance is claimed to be impressive enough for the end user to not notice much of a difference, and a live demo will be shown next week at a conference by the creators of Alien Dalvik, the Myriad Group. “From a user perspective, Alien Dalvik 2.0 is completely transparent and installed without user disruption. Users simply enjoy the same rich Android ecosystem they have become accustomed to via mobile on other key screens, such as playing Angry Birds on HDTV. As of yet, I don’t know of any killer Android apps that can’t be found on iOS, but in time I’m sure a few exclusives will come to the platform, and a tool like Alien Dalvik should be able to bring those apps to the iPad. I can’t see any reason why this wouldn’t work on the iPhone and iPod touch as well, and it might even work better considering there are more apps aimed at the Android smartphone market than the Android tablets, at least for now. 9to5mac notes that Alien Dalvik also works on other platforms, like Nokia’s N9, and they have plans to expand the platform to other smartphones, tablets, and even set-top boxes and TV sets. Alien Dalvik is paid commercial software, but if you want to run Android apps in virtual machines you can do so free with VM or VirtualBox of Android 4 ICS, amongst other releases. Please please implement on windows phone 7…. Jailbroken I assume. No way Apple would let that into the App store. DSLR tether app with camera connection kit. This gives me no reason to purchase Android anymore. I hope this is available without Jailbreaking the iPad, because I am against such things, but probably not. Why on earth would you be against jailbreaking? Do you believe it is illegal or against some ethical code? If so, you are completely wrong. Jailbreaking a device unlocks many tweaks, add-ons and extensions to the iOS running device. Best article I have ever read on the internet. Great job guys.